​When you see woodworking projects, your mind is probably coming up with images of big machines cutting up large and thick pieces of wood. That's woodworking all right, but that doesn't encompass all of what the craft is about. These projects might surprise you with how doable they are with the simplest of tools, making them easy to follow and make even for beginners. ​You don't really need a full-blown woodworking shop to produce even a single piece of anything that's made of wood. You might be discouraged from making something as small as a wooden flash drive because you're no professional, but that's just one among these many woodworking projects that will prove you otherwise. Maybe you're not a professional, but with these, you can be a legitimate DIY-er. If you can wait 10 minutes for a perfectly brewed coffee, you can allot a couple more minutes than that to make this wooden sofa sleeve. It goes perfectly on your sofa's arm and is where your cup can sit perfectly on. From appearance alone, it’s not that difficult to figure out. This tutorial makes it more understandable with easy-to-follow instructions. ​It takes some special skill to balance an almost-full cup of coffee or tea on an unstable surface like your cushiony couch, even if it's on its more stable armrest. This sleeve eliminates any need for that worry every time you need to put your cup down near you when it poses the risk of a destructive spill. There's something about the combination of candles and wood that gives a rustic vibe, which in turn makes your place feel a little more like home. 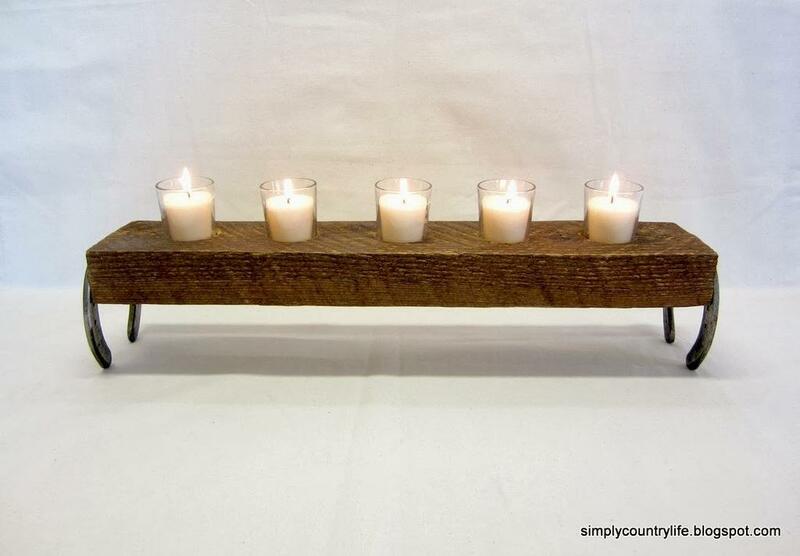 If you're already into woodworking but have yet to polish your skills, this five-candle holder DIY will give some of your leftover chunks of wood a new lease on life. Not only that, everything it's made of are essentially excess. ​A horseshoe isn't exactly the most glamorous of metals but together with the wood and candles, the whole piece becomes elegant enough for your coffee table. If it doesn't work for you, you can always switch it out for other metals you have. To a complete beginner, this wouldn't even take an hour. ​Some projects will be harder than others, despite looking as if they're easier to make. This project is one of those kinds. It holds one small tealight candle, significantly less than the previous candle holder, yet it takes more tools and materials to make. You might also have to free up a whole afternoon, which is already the maximum if you're a beginner. However, after all these disadvantages compared to the other candle holder, the end result can look infinitely better. ​Regardless of how small this little candle decoration is, it makes all the difference when its mood lighting covers a large part of the room, if not the entirety of it. This is especially cozy on a gloomy day or at night. Whether you're an employee or an entrepreneur, it's a commonly mutual advise to always bring a business card with you. Networking events are a given but you never actually know when you'll need one to hand out to somebody you meet on a whim. You might meet the person who'll give you your next opportunity on your next coffee run. Just as you give all your other cards a home in your wallet or card holder, your business cards deserve a place of their own considering they open up connections and expand your circles. By place, we don't just mean your pocket. Within your shirt pocket, this wooden business card holder will act as protector for your business cards. For a simple thing, this requires some less than simple tools. Comprising of only seven steps, this tutorial is not that hard to understand. The same goes for application. Make sure to allot at least an hour for the whole process. ​Here's a small DIY for the exterior of your house. An address number display on the outside may soon be irrelevant. We never know what technology can whip out next, but for now it's a luxurious décor that adds to the little details that make your house unique. 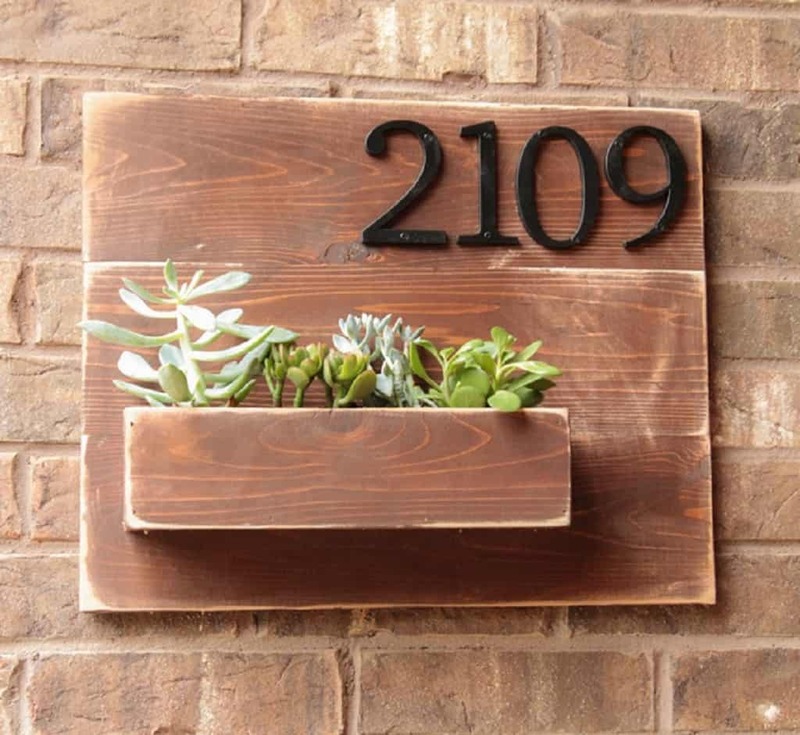 This address number plaque looks simple enough for a beginner but don't underestimate the work to be done or tools to be used. This can take you an hour, but mostly because of all the measuring and aligning of the numbers and the planter. ​More than the actual use of tools, the little tasks that go in between can be more tedious. However, if you're patient enough to stick it out to the end, this will give you a pleasing address number plaque that's unique to only you. Visitors and exciting packages will easily find you with this little guide in front of your home. This project is another one for the exterior of your house, and not just outside your door but actually on your front lawn. This project makes woodworking so accessible to beginners because you don't have to worry about making a mistake in the process. You can just let it unfold and make it as quirky as you want it to be. ​This can be used as a legitimate arrow to point to your house as an added detail to your house décor. Another way to make this usable is as decoration for Halloween, as it was made in this tutorial. With a little altering, this can be made for any holiday like Christmas, Easter, 4th of July, or whatever else you can think of. ​Making a flash drive probably never once entered your mind. Surely, making the actual USB requires some more knowledge than woodworking. However, with that covered, you can create its housing, which makes up the other half of it, using wood. Still, it would look as if it's been bought from a store and not handmade. ​This tutorial details how to do that with the littlest tools that can be easily available to anyone. There's nothing here that would make it as risky as other woodworking projects yet it will test your woodworking skills just the same. After a good 15 minutes on this task, you can end up with a wooden flash drive that looks nothing like anyone else's. Don't be fooled by the number of materials on this list above or the size of the wood you'll be working with. A magazine holder definitely needs to be bigger than most of the projects we've tackled so far, but it's almost as easy as nailing a frame on the wall. ​That's most of what you'll be doing with this DIY project anyway. Other than marking and cutting the wood, nailing them together is what would complete the whole process. That's why this could be an easy peasy instant project for the experienced woodworker. For beginners, this wouldn't even take a whole hour. The previous magazine holder can be associated to its more traditional design. This x-shaped magazine holder, however, is more modern and complementary to trending industrial tastes. It's one of those things that look simple, yet when you think about it, they might be hard to make on your own. ​This tutorial will debunk those myths and show exactly how easy this is to make. To start with, it doesn't require that many materials. The only advanced tool would be the laser wood saw, but other than that, all the others can be acquired easily, if you don't already have them. For how easy this is, you might just have to give at most 15 minutes for this project, just like if it were a beginner's scroll saw project. With this floating wine bottle holder, your first question is probably “how.” Not about how to make it exactly but how it works. The answer is some simple science, specifically the concept of the balance of the center of gravity. Seeing it on photo might tempt you to try your hand at creating this to prove it's actually possible. After you're amazed by it, it's time to give in to that temptation because this is quite simple to make in just a couple minutes, depending on your ability to follow all the steps accordingly and apply them accurately. Heck, it's not even as hard as cutting wine bottles with a tile saw, and we've proved that to be simple enough too in our previous article! ​This wine bottle holder has the ability to draw a lot of amazement and compliments from people who see it. It's also a good conversation starter. ​After that wine bottle holder, no other piece of its kind might bring the same awe out of you. However, the number of wine bottles this wine rack could hold might just make it a contender. Apart from being able to store more bottles of wine, this wine rack is also easier to make with less tools and materials and even less steps to complete. ​As a bonus, this wine rack won't give you anxiety like the other one probably would. It's not as risky because it won't threaten to fall with a little nudge and it gives you more selection for wine nights. We know just what would go beside your wine rack and wine bottle holders: this wooden bottle opener. Iconic wine opening experiences are the ones that don't need this tool, but some wine bottles can only be opened with it. We're also guessing some of your other beverages that require a bottle opener are close by. You never know when you'll need this, and despite the many creative ways people have discovered to open a bottle without an opener, this is just handy to have lying around for whenever the need for it arises which is often than you might expect. ​This one doesn't take so much time and materials from you at all because it can be done in 15 minutes with scrap materials that's just an excess to you. Woodworking skills can also come in handy if you're interested in fashion. The two might be far from being related, but they can overlap when you make wooden accessories like this wooden ring. For how little it is, this project might take you 2 hours at most and waiting time that could take 2 days. If you're not up for that, what you'll miss out on is a sturdy and fashionable piece that is rare to you and a few others who waited it out through this project. It's not that hard to begin with, yet you get something special that could mean a lot to you and that you could wear on your finger. From rings, we come now to the more common and widely used accessory: earrings. Almost every woman has standard lobe piercings where matching earrings are placed. One type of earrings is particularly trendy nowadays. It's the hoop earrings. ​Hoops are everywhere, in all colors, types, and sizes. From classic silver or gold metal hoops to transparent lucite ones, jewelry makers have come up with various versions. You may be no jeweler but these wooden hoops can be doable by you. This is one of those woodworking projects that will only take up 10 minutes of your time and about four materials but it will result in what could possibly be a part of your daily accessory rotation. We're not done with fashion pieces made of wood just yet. The material alone is something that needs to be incorporated more into mainstream and high fashion. Take it from Gucci who's already made a signature out of their wooden bag handles. ​While the rest of the fashion world is still sleeping on this possible fashion statement, be a trendsetter on your own with these DIY wooden bangles. In less than 10 minutes, this project gives you something to add to your collection of arm candy that can stand through the constantly changing fashion seasons. From the photo alone, these bookends might look like they came out of a fancy home and interior design store. In reality though, they're a product of a do-it-yourself woodworking project and thrifted ornaments combined. ​These L-shaped wood pieces make up the entirety of the woodworking aspect of this project. To make that, it would only take you half an hour. It's really the geese that attracts the most. You might not find these exactly, but there's plenty to find in a thrift store if you have a good eye for vintage pieces that would look good when repurposed. In recent years, you've probably seen a wooden ladder being used for indoor décor and as an appealing storage solution. As opposed to the ladder's almunium and fiberglass counterparts, this wooden take on it can be seen all over interior blogs and Pinterest boards. You might even spot a few being sold at mainstream interior stores. Instead of buying a standard-looking one, this tutorial gives you steps on how to make it on your own and even tells how you can customize it according to your space and to the appearance you want. ​What you'll see here is how it's used in the bathroom, which is common in other interior inspiration posts, but this can also be placed in the bedroom or kitchen. We're sure you can think of some ways it's gonna be useful in those areas too, and make it match your aesthetic. There are certain ways you can improve the look of your home without doing a full makeover. This wooden valance, for instance, can upgrade your bathroom if you put it over your tub or shower area as this tutorial demonstrates. Since this is purely for decorative purposes only, it's not hard to put it anywhere you deem would need more eye candy like your bedroom, a nook, or narrow entryway. Essentially, it's just a piece of wood with fancy curves, so it would only take you about 30 minutes to make the bare minimum. ​However, this is a very customizable project. If you happen to have other tools and a more advanced knowledge of woodworking techniques, you can incorporate them into this piece to make it more decorative. Something to go along with your valance and ladder is this bath caddy. If you have a tub and love taking baths regularly, you know that putting the right things that go around it are as important as drawing the bath. Candles, incense, Netflix on your laptop or tablet, and even a glass full of wine all make it more of a luxurious and calming experience. Not all tubs would have a place to put all these on to and it would just feel wrong to lay them on the toilet cover. This bath caddy provides space for things like that and more. Not only that, it adds to the cozy and rustic vibe. ​If you also made the valance and ladder for the bathroom, this will go well with those especially if you have a plain white bathroom that badly needs some accents. Compared to the first two projects, this one would require even less materials and even less time. National flags have become a design aspect across many things from clothes to interior décor. It's one way of showcasing pride and patriotism. However, some of us hold the same endearment for the state we came from or grew up in. One of the best ways to incorporate that pride into your home is displaying a map of your home state. Better yet, this cutout décor in the shape of your home as it appears on the map is an easily achievable DIY woodworking project that can do the same. ​It makes use of scrap wood and the most basic of tools to create in less than 30 minutes. There's no excuse not to make this if you plan on making a unique display of quirky wall hanging pieces on your blank walls. ​Related: If you want to spruce up your walls, you can also paint it an accent color. Remember those cardboard letters in craft stores that cost more than they should? Well, we're privy to how tempting they can be to get. They're unique because of the selection of letters and the many possibilities you can do to the cardboard. If you see this twig letter DIY though, you'll see there's so much more to what those cardboard letters can be if you just get creative. This woodworking project doesn't even require any power drills or the like. It's so easy that elementary students can do this in 30 undisturbed minutes or less. You just need to collect some good old twigs and use them to form your letter of choice, whether it's your or a loved one's initial. As a bonus, you get some exercise out of this project too as you go outdoors and hunt for discarded or fallen twigs. On the street, twigs might just look like another thing to add to the pile of garbage. When you pick them up and repurpose them into natural room décor, they can turn your place into a rustic heaven. It even beats those fake wooden décor that claims to give a rustic feel. This one is the real thing. ​Just like the monogram twig, this jewelry board is another easy DIY project that wouldn't take you more than 30 minutes to build. This one uses a drill though, but it's still not that advanced of a tool than other woodworking projects would require. It's beautiful to have a small contribution to the world at large. No, we're not talking about giving away a large sum of money to a charity or cause, or anything of that magnitude. Even something as simple as feeding animals has an effect. It might not seem like it does anything at all, but having a bird feeder outside your home can have a huge bearing on the life of birds who will benefit from it. ​Bird feeders are not the hardest to make. What is 20 minutes of making it compared to the lifetime of help it will extend to any bird that comes across it? This project will most likely connect you back to the simple act of doing good for the sake of it. Not only will it engulf you in the craft of woodworking, you'll feel better about yourself afterwards. They say a clean space helps in clearing up your head for any kind of work. This pencil holder doesn't only clear up your workspace by keeping your writing tools organized, it doubles as a source of motivation as well. Long periods of time spent sitting on a desk can take away the life and creativity out of you, especially if your job requires it day in and day out, which is true for most people. ​This pencil holder might just be the reminder for you not to let it happen. Leaving little pieces of motivational words around where you work might help. You can do that by making your own organizers. This pencil holder is handy for anyone regardless of the nature of their job and finishing it only takes about 20 minutes. Using the same concept as to creating the pencil holder, this makeup brush holder is basically the same thing, only specified for your makeup tools instead of your writing tools. There are many methods to how you can store your makeup brushes but the most advisable of all that many professional makeup artists would swear by is keeping them upright at all times if possible. This wooden stand does just that. It only needs two materials and it's done in almost an instant even if you're a beginner who's never touched a drill before. However, since these tools touch your face, you should probably be more concerned and extra careful about the hygienic aspect of this makeup brush holder as well. Other than that, this holder does the job done without giving you a hard time or spending a lot. ​By this time, digital albums have taken the place of photo albums, and picture frames have become irrelevant. Technology have really overtaken our lives to a significant degree but we can't say it has done so completely. We're only at the beginning and yet people are going back to analog. You see it in how polaroids are coming back to popular culture and film photos developed the traditional way are becoming trendy again especially among the youth. Put them on an equally mesmerizing picture holder like this, and suddenly your enthusiasm for printed photos will be reignited. ​Displaying printed photos are still one of the best ways to decorate your space. Propping them up on an equally special décor piece like this DIY wooden picture holder cube is personalization at its best. Both you and anyone who visits your place will most likely appreciate. That picture holder requires the most minimal work on your part. The result is nothing short of beautiful, but if you're up for something a little more hands-on, this wooden photo display takes you on a real creative challenge. It tackles the process of transferring a photo onto wood, which takes a lot more steps and materials. ​It is doable for beginners, not to mention extremely enjoyable. We'd vote it as the best immersion into the fun aspect of the craft of woodworking. This might take you a little more than a day to finish, with all the waiting time in between, but if the end result shows us anything, it's that everything is all well worth it. Picture holders and photo displays sure make a sentimental and personalized choice for decoration, but too much and they become a little bit redundant. Like the thousands of similar photos you keep in your digital albums, they lose their meaning over time. Even if you put them in the prettiest frames, their special quality is lost on the quantity. ​Switch them out with art or in this case, some motivational and inspirational quotes to add variety. This wooden frame holder is a little bit different than frames you're familiar with. Since the wooden part is only a fraction of the whole piece, this would be easy to finish in just 10 minutes or less. A framed quote like the previous project can be motivational if it's by your desk where you can read it while working on something. However, they don't do much when you need a much larger and easily visible reminder that you can read from afar and will give you motivation for your day, whatever it entails. ​This plywood artwork provides a large enough display that will attract your attention and that you can immediately see upon entering the room it's in. Put your favorite quote on it that you're sure will instantly lift your spirits up. Then apply the same design elements done in this tutorial. Depending on how large you want it to be or how long your quote is, this shouldn't take you an hour to make. If your quote happens to be very short and can be played around with common letters, this scrabble tile wall décor can be easier to do and more eye-catching than the previous quote displays. ​Scrabble letters are easy to make and these enlarged versions for wall hanging are even easier because the larger wood pieces are in convenient shapes and they provide a large canvas for the letters. Anyone who see this will be in awe of the simple creativity that this project employs and yet the final output is very appealing. We don't know about you but if anyone ever puts down a glass or cup on any of the surfaces in our home, we'll be pulling a Monica Geller on them and quickly remedy the situation with a coaster in less than 5 seconds. However, you can always prevent this whole mistake altogether by providing a set of coasters ready for use on the coffee table, side table, or anywhere guests might put down their drinks on. ​These dipped birch slice coasters are not only functional coasters, they're also a sight to behold. Birch is a glorious kind of wood that looks clean and elegant when polished. Just cutting down a branch into pieces will already give you a set, but dipping them on different paints will give them an extra play on textures and colors. The process is obvious and it shouldn't take you more than a couple of minutes to make a full set. One of the best things about DIY projects is how you can repurpose things to function differently as they'd been intended. If not environmentally-friendly, it's simply amazing to find new ways to incorporate something into a project. It's especially exciting when something easy like this can hit so many needs in one piece and in just 20 minutes of work time. ​This wall organizer uses a bungee cord, which can make this storage solution appealing for both men and women's interior tastes. The possibilities are endless with what you can put on this wall hanging piece. Some have used it for kitchen utensils, sunglasses, accessories. You can even use it for your woodworking tools. One thing is for sure though: you're saving space in the room and maximizing vertical space of your walls. This driftwood holds a lot more than necklaces when put up in a room. It holds a lot of personality in itself and reflects your quirky taste for décor in the process. Any kind of wood instantly gives an accent to a place, but the rawness of this necklace holder's look epitomizes the word “rustic” more than any other. Added to that are the variety of doorknobs that doubles as the hooks for the necklaces. One of the best things about this project is everything can probably be found at the thrift store and in your excess supply of wood. ​Joined together, it tells so many stories of where each piece comes from without being over the top. The second best thing about it is it takes no time at all to make because you just have to put pieces together and then leave everything as is. No polishing or finishing touches required – all part of its charm. ​Gadgets have made it easy to look at the time. Almost every device displays the time once you open them up, but they also double up the chance of you breaking focus and getting distracted from what you're doing. Once the screen lights up, it's a downward spiral to apps. When it comes to telling time, nothing beats a wall clock. It does the job without the temptation to drive you away from a task. You'll find plenty of wall clocks in stores easily, but they don't make them with careful attention to function and detail as they did. It's better to make your own with wood, specifically a raw slice from a log or a tree branch. ​This tutorial teaches you how to do that in just about 30 minutes to an hour. Unlike the mass-produced wall clocks you'll find everywhere, this one tells the story along with the time. It will also give character to your space with its wooden surface and rustic appearance. Place mats are usually made with plastic or fabric materials, thus the word “mats”, with pretty and sometimes colorful patterns. Rarely do we ever consider wood as appropriate alternatives, considering how the material works well as coasters. ​This tutorial copies the quirkiness of fabric or plastic place mats and turns the unfinished wood into something of the same kind with just paint. This project also breaks the record as it requires the least amount of materials. There's very little work to be done and in less than 5 minutes sans the waiting time for the paint to dry, you'll be finished with a fully functional and probably more useful place mat than what you could buy from the store. If wooden place mats are too foreign of a concept for you, maybe wooden trays wouldn't be too absurd to comprehend. Wood is great for typical kitchen or dining spills and messes because they won't have to be washed to often or be ruined easily by stains unlike their fabric counterparts. This wooden tray can be used for serving drinks and plates of food and you don't have to worry about round wet stains on your tables or food crumbs and particles scattered invisibly everywhere. Other than this purpose in the kitchen, this tray also works well as a base for your centerpieces like vases, candles. ​It organizes these things well and adds to the look of the whole place. Anything in a geometric shape instantly amps up the aesthetic, so this DIY is just right because of the hexagonal shape. With the free plans and visual guides, this tutorial will allow you to work on this in as quick as a few minutes. How many solutions have people invented just so small gadgets would stay upright? There's the kickstand, popsocket, Spigen Style ring, and other kinds of mounts and stands. Some tablet cases would even have foldable covers that comes attached to the case of the device. ​Out of all these, nothing beats a standard phone and tablet stand. This is the safest bet that won't wobble or risk an accidental fall because it provides support on every side. It won't let you down when watching a movie or reading a book on your gadget. You can make a wooden one on your own with this tutorial in about an hour or two. It's still less than the time and money you'll spend buying one and the best part is you'll be sure of its quality. Here's another “stand” that can do more than just hold your phone upright. This project is an example of how people can use their smarts to level up everyone's quality of life with the littlest possible loss. This passive speaker – meaning it requires no electricity or battery to function – controls the journey of sound waves so that the music that comes out of your smartphone will be broadcasted louder than it would on its own. ​An actual speaker usually empties our wallets because of how expensive they can get. This wooden speaker is something you can do with good old woodworking tools and materials, which you can get for much less, and it can be done in one afternoon. While the previous gadget stand can be used for both phones and tablets, this project is more suitable for tablets. This dock does the same thing of holding your tablet upright while you read or watch on the device. However, this one is easier to make. You can also make several versions of it for every slanted position you want your tablet to stand. ​This is handy to have at the ready on your desk, especially when you constantly work on it and you need it in one position instead of holding it all the time. This doesn't take up too much space and provides the perfect opportunity for you to use an external keyboard that will make things even easier to work with. All things in the kitchen should be easily accessible. Cooking can be time-constrained and when things are out of reach or takes an effort to get, those few seconds lost can be detrimental to the end product. A paper towel is just one of the things that needs to be available stat, especially since cooking can also be messy. ​This paper towel holder steadies the roll so that it's easy to get a couple pieces using just one hand. What we love about this DIY version is it includes everything you need to know about how to make it in a very easy and understandable visual instruction. It cuts down the working time to probably just an hour. This will guide you into making one of the most professional-looking woodworking pieces you might've ever done on your own. If you need the paper towel holder in the kitchen, there should be an alternative for it that's more appropriate for the dining area. This napkin holder looks much better to be put on the dining table. It would sit right with all the food and not take away from the nice arrangement you've prepared, especially when guests are around for an intimate dinner. ​This would probably take you a few minutes to set the wood together, while drying time for the glue might take longer. Nonetheless, it's really the white script lettering that reads napkins against the dark wooden background is what really makes this aesthetic complete. ​It's not only paper towels and table napkins that need a home in the kitchen and dining area. Your utensils could also use a permanent home if they don't already have one. If not, a temporary one that's only whipped out once in a while will do too. When you have guests around, it doesn't look that good to let them get spoons and forks from the drawer. Propping them up on something like this utensil organizer will give easier access and make you look like a good host too. ​This organizer will probably take a few minutes, no longer than an hour, especially if you can get a wooden box to start with. There's so many uses to this. Utensil could mean different things. It doesn't really have to refer to kitchen stuff, so if you get creative, this one can be a versatile piece for your home. From holders and organizers, this wooden cutting board project is one that you can actually use actively while cooking. Wooden cutting boards can come expensive especially when it carries a big brand name. If you're more budget-conscious and savvy, making your own should not be out of the question. ​This project is very easy to make and finish in one afternoon. As the photos from this tutorial would prove, these wooden cutting boards don't look like they'd been DIY-ed at all. If anything, it looks professionally done but with the cost of a DIY project. As you would see, these materials can create more than one board. If you know how to make it, you won't have the need to buy this kitchen essential ever again. This rustic magnetic wall rack is less intimidating than its metal alternatives. Unlike the other, this one is also easily done by yourself. The wood rack's size will depend on how many kitchen tools you'd like to store on it, but in general, the shape of the rack and the method to create this project is relatively easy to get done in less than an hour. ​With this DIY project, there's more to consider about its compatibility with your home than the materials or the amount of work. This isn't very kid-friendly, so you have to weigh in safety before deciding to go for an exposed display of dangerous tools like knives. Otherwise, this is a nice way of storing them and it's weirdly aesthetically-pleasing too. ​Woodworking is enjoyable for the risky and challenging process, and also because you see through the creation from scratch to something usable and beautiful in the end. Something that will excite you just as much is woodburning. It entails a different kind of thrill because you don't have to necessarily build something big but the process gives an experience in itself. This particular project is something of that nature. It's a little monogrammed wooden keychain wherein the letter is formed by burning the wood according to its outline. This is an easy last minute gift because of how fast you can make it – about 15 minutes if you're already crafty in the first place. If not a gift, then you can make this into a fun activity to do with your friends in your quality time. Durable guitar picks can be surprisingly expensive for how little they are. Those that carry big names or are signed by famous musicians can be priced even higher. Unless you're really awaiting to cop a certain star's collectible guitar pick, there's no sense in buying what you can do on your own in five steps and about 15 minutes. ​What's better is you can even customize it to your own preference, whether it's the size, color, design, thickness, shape, or however else you can personalize a guitar pick. You can also make this as a gift for your friends who are guitar players or enthusiasts. Rulers are one of those things that every household should have. Sometimes they would seem as if they're just useless clutter but you never know when you'll need them. When you do, they seem to disappear mysteriously. Knowing how to make your own will eliminate the dilemma of overstocking because you wouldn't buy more than you need or of you not having one when you need it. Since they're simply a long piece of wood with measurements along its length, it's pretty easy to understand how to make them. This won't take any time at all, especially if you know how to work the tools, which are easy to learn for beginners too. ​These things aren't that expensive but when you have more than one kid, these things pile up and comprise a large expense. This will also save you a lot during back-to-school season. If you're a kid who grew up playing board games, dices will be a very familiar and nostalgic thing for you. You can recreate the little pieces into enlarged versions that can be part of the decoration in your adult space. It will bring back memories from childhood and also remind you of simpler times when you were young. ​This DIY tutorial on this project details the very easy process of creating an oversized dice. It only takes three items so you can make plenty of this in one go. It will only probably take an hour to make three pieces, which can be separated in different rooms or piled up as part of your coffee table centerpiece. Scroll saws are one of the most common tools that can be used by beginners and experts alike. This wooden lantern made using a scroll saw is something a beginner can take on. It's not that hard given you're provided with the steps to make one. You have the option to make your own pattern or use another that would make this easier for you to make. ​As we've already mentioned, candles, whether fake or real, or even just a standard yellow bulb combined with wood gives off a rustic and cozy vibe, which is perfect for the gloomy days and cold nights of the fall and winter seasons. We've included plenty of projects here that could be part of your table's centerpiece, but we haven't given you something that could actually be the main attraction. Well, here it is. Essentially, it's just another vase centerpiece but it's actually different from what you usually see. ​Instead of the typical vase, either it's glass or clay in different shapes and colors, this one uses a wooden square base and mini test tubes for each individual flower. Working with little pieces of wood like this makes it no harder than the easiest projects in this list. Simultaneously, it gives you a really eye-catching centerpiece that can draw compliments from anyone who sees it. With all these projects that are appropriate for beginners, you can really tell that it's easy and fun to get into woodworking projects if you pick the right ones you can get a lot of use out of and extract much fun from. Whip out those woodworking tools, don't let them rot in rust, and maximize their use to make the most budget-savvy and interesting pieces you can add to your home, fashion, and interior collection.